Lewis_Carroll is a Legacy Library. Legacy libraries are the personal libraries of famous readers, entered by LibraryThing members from the Legacy Libraries group. » Lewis Carroll's legacy profile. Lewis_Carroll is also an author. 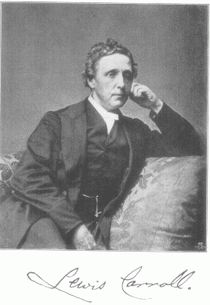 » See Lewis Carroll's author page. About meI'm best known as Lewis Carroll: author of Alice's Adventures in Wonderland (1865) and Through the Looking Glass and what Alice found there (1871). But my real name was Charles Lutwidge Dodgson: Oxford don, mathematician, logician, Anglican clergyman, and pioneer photographer. In life I tried to keep the personae separate. About my libraryThis catalogue is best viewed with "comments" showing. 4.) "Art & Antique Agency, Oxford" (catalogue of a seller of books and rarities - only partially numbered). Only the books will be entered, and we'll skip the teapots, plaster casts, and costumes, &c.
Note: The booksellers purchased at least some of their inventory at the auction, when possible to identify these with certainty the entries will be merged. Also of interest for this library is Lewis Carroll among his books : A descriptive catalogue of the private library of Charles L. Dodgson (2005) by Charlie Lovett. Additionally the bibliography in The Life and Letters of Lewis Carroll (1898, using the 1899 printing though) by Carroll's nephew Stuart Dodgson Collingwood will be taken into account, since it shows which books by Carroll the family was aware off at the time of his death. It will be used with caution though. For information about Carroll's own more obscure works, like the question under which name he published it, we will rely on The Lewis Carroll handbook by Sidney Herbert Williams & Falconer Madan (1931, but using the 1979 edition revised by David Crutch). Works of which we can be sure that Carroll knew them, because he either quoted or parodied them in his own work, or mentions them in his surviving correspondence, may get entered in a final stage. If so, they will be in a separate collection. The same goes for works that were logically in his library but remained in the family (the Diaries, for example). Publication info will only be given if and in so far as explicit in the original sources, or if can be logically inferred. Obviously every effort will be made not to infringe upon the copyrights of either Mr. Stern or Mr. Lovett.